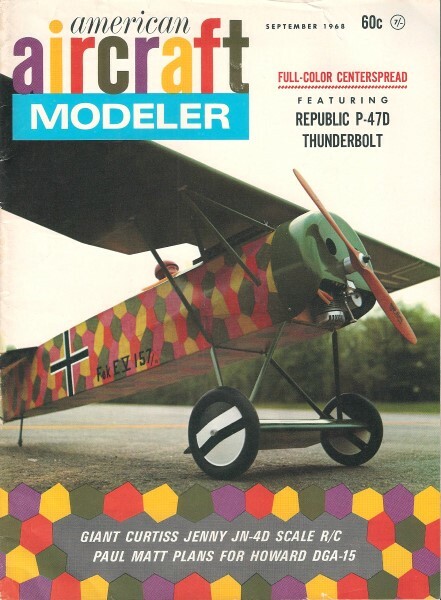 This article for the Imperial War Museum appeared in the September 1968 edition of American Aircraft modeler. "The Imperial War Museum, London, England, was founded by the War Cabinet in March, 1917, and established by Act of Parliament in 1920 as a memorial to the effort and sacrifices made by men and women of the British Empire during the First World War." Among the array of weapons there are displayed about ten semi­cutaway aircraft models of World War II. 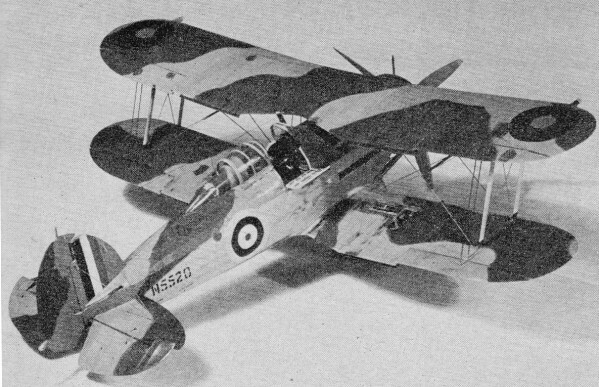 There has undoubtedly been many more models added to the Imperial War Museum's (now the Imperial War Museum Duxford) collection in the 40+ years since this article was written. 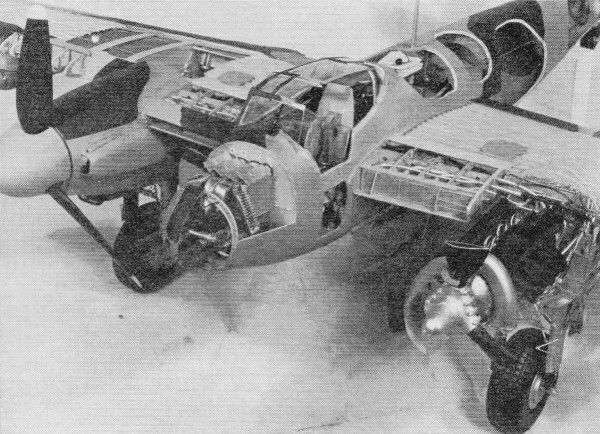 Mosquito VI was equipped with two 1460-hp Rolls-Royce Merlin 12-cylinder liquid-cooled engines and armed with four 20-mm Hispano cannons under the floor and four .303-in. Browning machine guns in the nose. This aircraft was built of plywood with exception of nacelles, wheel doors, ailerons and elevators. Its top speed was 380 mph at 13,000 ft. and a service ceiling of 34,000 ft.
Typhoon IB was operational from November, 1942 until end of World War II. It was equipped with four 20-mm Hispano Mk I cannons and 2200-hp Napier Sabre IIB engine. Eight 3-in. rockets could be mounted under both wings. Maximum speed 409 mph at 10,000 ft. Rate of climb was 5 minutes 55 seconds to 15,000 ft. 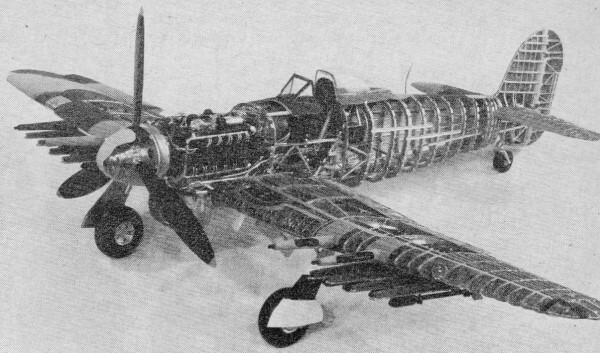 It was originally designed to counter the FW-190, but was found better in a ground attack role than in intercepting. The Hawker Typhoon m, in 1/12th scale, is shown in 198 squadron markings as it appeared in France in August 1944. 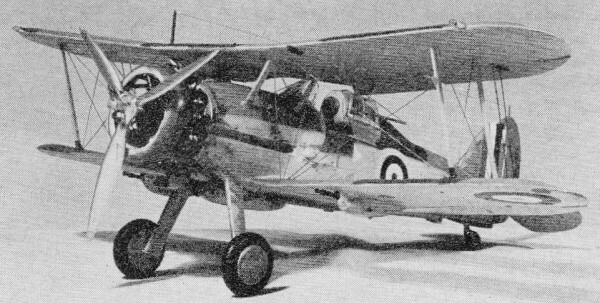 Lancaster Mk I was equipped with four Bolls-Boyce Merlin 20's of 1280 hp. It ap­peared in 1942, armed with eight .303-in. Browning machine guns. Its maximum bomb load was 18,000 lbs, Its maximum speed was 275 mph fully loaded at 15,000 ft. Range was 1730 miles with 12,000-pound load. The Lancaster changed little throughout its life, a tribute to the soundness of the original design. THE Imperial War Museum, London, England, was founded by the War Cabinet in March, 1917, and established by Act of Par­liament in 1920 as a memorial to the effort and sacrifices made by men and women of the British Empire during the First World War. The purpose of the Museum is to collect, preserve and dis­play materials and information bearing upon the two world wars, Korea, Kenya, Egypt, Malaya, and other military opera­tions since August, 1914 in which Great Britain or other members of the commonwealth have been involved. Among the array of weapons there are displayed about ten semi­cutaway aircraft models of World War II. These models show every detail of the interior of the aircraft, such as the engine, ammunition belts, bulkheads, spars, ribs, fuel and air lines, and machine guns. Most were built by Mr. C. V. McCann, a member of the Museum's exhibition staff. Each required about three years to complete. All parts are constructed from scrap metal, plastic or wood. No prefabricated parts were used. Other aircraft models, in the World War I period, include the German Fokker E 1, the first plane with machine gun firing through its propeller; the FE 2b, a fighter-reconnaissance air­craft; the SE 5, one of the best fighters in World War I; the Handley Page 0/400 of 1917, the first British heavy bomber at that time; and the German Zeppelin L33. The number of air­craft models in this museum, is small compared with that of our Smithsonian Museum, but is of excellent quality. The museum houses a notable collection of full-scale aircraft from earliest days of military aviation to the advent of the jet engine. Aside from aircraft the Museum has about a hundred models of war ships, several models of tanks, and a large collection of machine guns, grenades, rifles, orders, decorations, medals, uni­forms, and tanks. 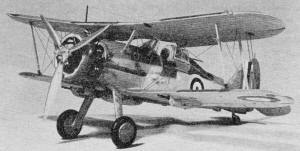 Gloster Gladiator was equipped with Bristol Mercury VIIIA 830 hp supercharged nine-cylinder air-cooled radial engine. Armed with four Browning .303-in. 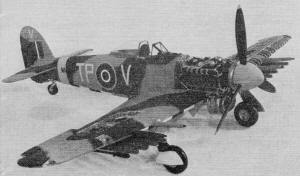 guns, two mounted one on each side of the fuselage and two mounted on the under side of the bottom wing. Its top speed was 257 mph at 14,600 ft. and service ceiling was 33,500 ft. This was Britain's best biplane before the monoplane era, begun by the famous Spitfire, Hurricane, etc.